For the love of red wine, sometimes we have to pay the price – in stains. And we don’t just mean your teeth. Having a house full of guests sipping on red wine while hovering over your new carpet can put you into an anxiety-inducing game of follow the glass. But don’t fret! There are ways to fight off and remove those stubborn wine stains and hopefully combat your anxiety as well. 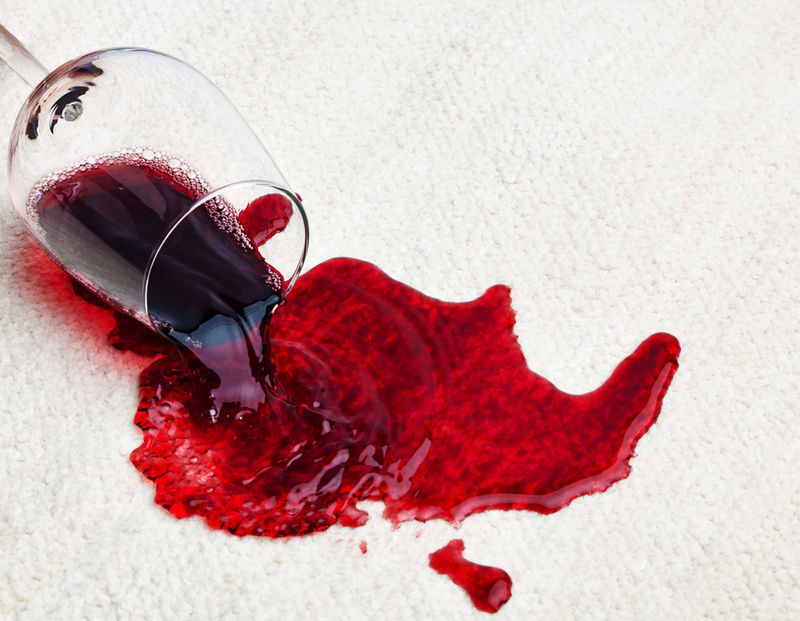 Here are some of the best ways to remove red wine stains if that glass should ever fall. First off – the quicker you can deal with the wine stain, the better chance you have at removing it. But that doesn’t mean you should frantically fling your guests out of the way. Grab a paper towel or something that’s absorbent and just start blotting the stain in an up-and-down motion. It’s important that you avoid rubbing it – that will only make it worse. The goal here is to work from the outside in. Cold water is great at helping to remove stubborn stains, so grab a cup or bottle of water and gradually pour a little water on the stain to help loosen and dilute the wine. Continue to blot and you’ll start to see it lift. If you have a particularly stubborn stain, once you’ve removed as much excess wine as you can, any remaining wine can usually be removed by covering the damp spot with salt. Since salt draws out moisture, it’s important that the stain remains a little damp, so pour some water on it if you have to. Add a generous dose of salt on top of the stain and let the salt work its magic. The longer you can let this sit – the better. But once the stain seems to have dried up, or the salt has a slight pinkish hue to it, it can be removed. This cleaning solution can work wonders when you need it to. Take a large bowl and mix two cups of warm water with one tablespoon of dishwashing liquid, and one tablespoon of white vinegar. Using a clean towel or rag, apply the solution to the stain and blot away. Have a dry towel beside you to alternate and dry up the solution every minute or so. If despite all your best efforts you can’t remove the stain, or you’d rather sit back instead of applying your best efforts at all, professional carpet cleaners in Ottawa like JaDoc Inglis can help! We use high-grade products and equipment to get your wine-stained carpet or rug looking better than new. So the next time you’re hosting a party and red wine is the drink of choice, you can sit back and relax knowing you’ve got your stain kit prepped and ready to handle any messy situation.